All those who competed or officiated in the winning, 5 in a row National Bowling Arm Championships 2013-2017, received this lovely and much appreciated certificate of recognition in the mail this week. Thank you Bowls Vic. Victorian State Selection Trials will be held on Sunday, March 11, 2018. 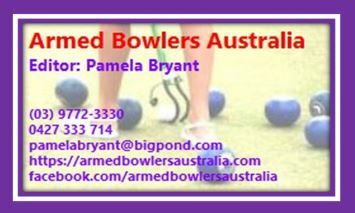 Click here for more details from Bowls Vic. Click Here to check out the YouTube of the 2017 event from Bowls Vic. Vic’s win 5th, in a row, at the National Armed Championships! Congrats to all States participating. There’s 31 photos for you to view.